FWE's Proofer Heater System creates a stable, controlled environment of heat and moisture which circulates gently throughout the interior of the cabinet- eliminating hot and cold spots. This system is designed to give you control of the cabinet environment, allowing you to create the balance of heat and humidity to your requirements. 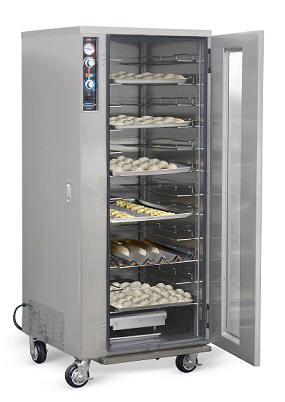 FWE's Proofer Heater System is a humidified warming cabinet that encourages fermentation of dough by yeast through controlled humidity and warm temperatures. Increased carbon dioxide production occurs due to warm temperatures, increasing the activity of the yeast. This results in a higher, faster rise. Since moist air delivers more energy than dry air, the controlled humidity permits the dough to rise without dying out, while also assisting in the transfer of heat. FWE's PH System also serves as a great back-up for general holding needs when not being used for proofing or prep. These systems are two cabinets in one, dual purpose cabinets that both proof and heat - eliminating costly duplication of equipment! FWE's Exclusive Design allows select units to be used as heated holding and transport cabinet for your bulk foods when not in use as a proofer. Simply adjust the heat and humidity controls to suit your moisture level. . . and move them where you need them! Humidity can be added and adjusted to preserve the moisture content of the food, keeping the food fresh and hot for hours. Proofer Heaters allow you to maintain the desired heat and humidity balance for uniform raised dough results without having to cover your dough! FWE's proofer heaters are the most versatile and best performing humidified holding bulk food cabinets on the market. We have humidified holding carts to fit any size operation, and can accommodate a wide range of trays and pans. Consistency throughout - The built-in proofing system balances moisture and air to proof your food the way you want it and permits greater control of holding food environment for longer holding times. Built to last - FWE solid stainless steel construction is built to withstand continuous, demanding use. Constructed of stainless steel, with welded base frame for strength and ease of mobility. Heavy duty casters mounted to reinforcement plates - take impact over thresholds. Built to meet your needs - All FWE Proofer Heater System's come standard with insulated reinforced, field reversible doors, providing flexible installation options for kitchen layouts. Easy to use - Upfront and recessed control panel has separate, easy to read and set, controls for "HEAT" and "PROOF". Easy to clean - The Proofer Heat system is built into the cabinet to reduce maintenance and cleaning costs. Removable humidity pan provides a large water reservoir that is easy to clean and replaceable. FWE knows commercial equipment needs to be versatile, that's why we provide a wide variety of features and options. FWE has a proofer heating cabinet that is going to fit your exact needs, to learn more CLICK HERE. FWE Offers several ENERGY STAR certified proofer heater systems, to learn more and see a full list of certified models, visit fwe.com/energy-star.